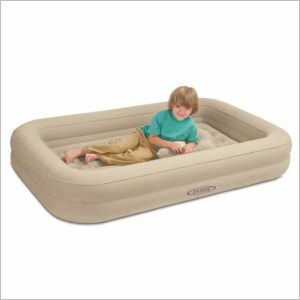 An inflatable toddler bed can be a lifesaver when you’re taking a trip. These beds are usually lightweight, portable, and when you’ve reached your night-time destination, all you have to do is blow it up and pull a fitted sheet over the mattress. When you’re staying in a hotel, putting your toddler in his own scary and enormous twin bed is not usually a good option, but you probably don’t want him to sleep in your bed either. With an inflatable bed for kids all difficulties disappear—set it up on the floor beside your own bed, and the little guy will be close but not too close. Is the bed durable? Toddlers don’t walk with quiet mincing steps, and you can expect an inflatable bed to get used like a bounce house occasionally, though it is wise not to encourage such behavior. Can the bed stand up to some occasional toddler rough-housing? What are the dimensions? You want something toddler sized, and if it’s the same size as your toddler’s crib or toddler bed mattress at home, you’ll be able to use the same sheets you use on his ‘real bed’ – a big plus. A little extra continuity, even just in sheets, can give your toddler a more peaceful night and help him to feel that all is right with the world. Is there a bumper? If your toddler rolls around at night, you’ll want an inflatable todder bed with a bumper or rim that will help him stay in place. How is the bed inflated? If it comes with a handpump, how long will it take to get the bed inflated? If it comes with an electric machine, how reliable is it? Or are you expected to blow the thing up with your own breath? 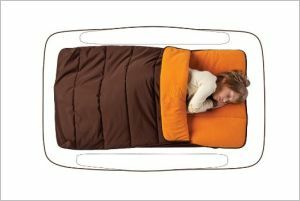 I like the IntexKidz Travel Bed; an inflatable bed that has two parts; a mattress, the same size as your child’s crib mattress or the mattress in his toddler bed, and a nice high bumper. This bed is perfect for keeping wild sleepers within bounds at night, and that ‘from home’ sheet will make your toddler feel perfectly at home. The IntexKidz Travel Bed comes in it’s own bed for easy put-away; it also comes with a hand pump, which may or may not be enough to do a tolerable job inflating and deflating. Some reviews are positive; others say no. If it turns out not to be good enough for you, you can get an electric pump and nuke that air in. Amazon’s top bestseller for inflatable toddler beds is the Shrunks Indoor Travel Bed, another very nice toddler bed that includes an inner, crib-mattress sized area that fits your sheet and a rim with two little “rails”. The rim isn’t as substantial as that of the Intex, so this bed may not be as ideal for an active sleeper, but if your child tends to stay in his place at night it may be the perfect bed. It comes with a handy electric pump, as well as a repair kit and a carry bag.